Is there a connection between sound, vibrations and physical reality? Yes, and it is called Cymatics. 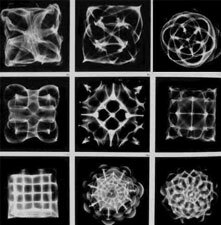 Cymatics, the study of wave phenomena, is a science pioneered by Swiss medical doctor and natural scientist, Hans Jenny (1904-1972). It is derived from the Greek 'kyma' meaning wave and 'ta kymatica 'meaning' matters pertaining to waves. In 1967 Dr. Hans Jenny published a book titled Cymatics. Inspired by systems theory, the work of Ernst Chladni, and his medical practice, Jenny began an investigation of periodic phenomena but especially the visual display of sound. He conducted experiments animating inert powders, pastes, and liquids into life-like, flowing forms, which mirrored patterns found throughout nature, art and architecture. All of these patterns were created using pure tones (simple sine wave vibrations) within the audible range. He was able to create a physical representation of vibration, or how sound manifests into form through the medium of various materials. His fascinating work offers profound insights into both the physical sciences and esoteric philosophies. It illustrates the very principles which inspired the ancient Greek philosophers. These cymatic images are truly awe-inspiring, not only for their visual beauty in portraying the inherent responsiveness of matter to sound, but also because they inspire a deep recognition that we, too, are part and parcel of this same complex and intricate vibrational matrix. A simple experiment demonstrating the visualization of cymatics can be done by sprinkling sand on a metal plate and vibrating the plate, for example by drawing a violin bow along the edge, the sand will then form itself into standing wave patterns such as simple concentric circles. The higher the frequency, the more complex the shapes produced, with certain shapes having similarities to traditional mandala designs. Today, holistic healing practitioners use the term 'toning' to describe the use of sound waves transmitted through the human body in order to normalize imbalances and synchronize the cells' frequencies back to their natural, healthy state of vibrational resonance.